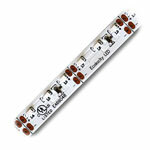 PWM LED Knob Dimmer, 12-24VDC 30A NEW! 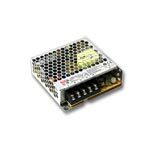 Our 1 channel signal amplifier / repeater is designed for larger lighting circuits to extend a PWM Dimming signal to additional single color low voltage LED Lights. 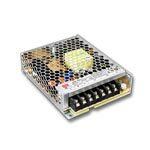 Once you have met the power limitations of your LED dimmer you can use this amplifier to dim an additional 30A of lights, or 360W at 12VDC / 720W at 24VDC. Simple to use screw down terminals make for an easy and secure connection for your power input and output connections. This product is intended for use with single color LED strip lights, modules, wall washers, or LED lighting fixtures that operate on 12VDC or 24VDC power. The Flexible Ribbon Star Supreme Warm White LED Ribbon is the brightest 24V LED Strip Light on the market. 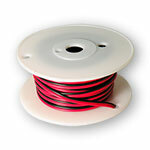 This UL Listed 118" (3m) LED ribbon can be cut every 1.16" and must be soldered to re-connect. Comes with 3M™ mounting tape on the back, for the best long-term mounting solution. 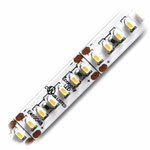 6 high output 3014 SMD LEDs per 1.16" for a total of 612 LEDs per 118" LED strip. This LED Ribbon strip is extremely bright, so bright it can directly replace T-8 and T-12 Fluorescent bulbs in light boxes, and signs. It can also be used for overhead lighting, cove, under cabinet, back lighting and many more applications. 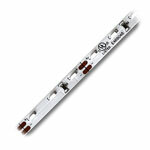 We recommended that you mount this strip to steel or aluminum, for a good heat sink. This light requires a 24VDC Constant Voltage power source, use the power supply calculator below to determine your lighting load. The warm white is a 3000-3500K color temperature, UL Listed for class2 luminaries and fixtures, RoHS and CE approved. 320W, 24VDC LED Power Supply / Transformer, 100 - 240AC input and 24VDC output through three terminals. For dry locations only. Has screw down style connections. Comes with plastic covering to protect screw down terminals and two cooling fans to prevent high heat during operation. Note: The cooling fan runs noisy and may not be suitable for all applications. It can be used to connect LED Wall Washers, LED Lights, LED Light Ribbons, RGB LED lighting and any other 24VDC Constant Voltage LED Lighting products. UL Recognized and CE approved. Can connect up to 300 watts of 24VDC LED lights. Only install face up or in a manner that the cooling vents face upwards with sufficient breathing space.